This is yet another version than you will see in the collage below. It may, in fact, be my favorite. Which one speaks to you the most? One of the lessons from Art Every Day Month I have learned this year is to look at my creations in different ways. I’ve been focusing on finishing and recycling my art projects as well. I tend to do one of two things: start and not finish and stockpile unfinished gems OR finish gems and put them in a pile of finished yet unappreciated work. I am in the middle of a mixed media work right now and I am not sure which direction it wants to be taken so instead of just setting it aside completely, I thought about what I might create with what I had. 1. Take photos of sections of the work of art, like cutting your work into pieces of cake. 2. Choose the “piece of cake" that tastes yummiest to you. 3. Playfully experiment with photo editing to consider and discover the many ways that particular art could become other art or serve other purposes both for you and also new products to bring to your art market. In these examples, you will see how the same slice of my collage has been given three different makeovers. I used pixlr. com, a very simple photo editing website, to revise my images. Each different one took literally less than a minute. Once I had the main image the way I wanted it, the others were simply different filters. That's it. I see the top image as the most conventional. It is romantic, feminine and probably the most favorable to conventional viewers. The second image is using a newspaper style. I wasn't wild about it at first and used it mostly to show contrast, but now that I look at it longer I see how well it would work under some circumstances. It seems bleaker to me, more nebulous. I can't see the clothing pattern as clearly so it seems more like mush that something creative. The dancer in the front looks sad, lonely, perhaps a bit lost. There are some who may get the most excited from this particular image. Do you see all the possibilities? I like to think of the bottom image as perhaps the most interesting. I feel dizzy when I look at it, not unlike when I took dance lessons as a little girl and spun around before I learned how to eliminate that by strategic focus. I also appreciate the more intense colors along with that dizzyness. Looking at the complete ladder of images I also see how I could photo edit further by numbering each of the images - yes, actually adding a numeral - and some words right over each image. I have heard wonderful reviews of PicMonkey but I have yet to use it. This weekend that is one of my goals. 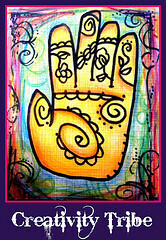 To check out PicMonkey and perhaps to begin using it. Pixlr is so simple, I hope PicMonkey can match it. I used to use Picnik, which I heard is a lot like PicMonkey: another encouraging fact. Between my use of instagram and pixlr and mixing them up together, I could play with images and create both digital art as well as 2D and 3D art probably all day long. What simple image editing program do you most frequently use? How could using one image in different ways spark your creativity both in your "play" and in your blogging and life work? While it is late to join Art Every Day Month - Leah Piken Kolidas has been inspiring many of us for years! 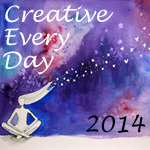 Check it out - the website is awesome and has a Creative Every Day Year Long Challenge I am sure you will enjoy! Last Spring, my son Samuel waited patiently while I snapped a series of photos similar to this one: that was when my shopping cart love affair began in earnest. I can’t remember exactly when I noticed it, but sometime last Spring I noticed an empty lot on the road to my daughter’s high school – which was adjacent to an old, rundown neighborhood and the county hospital. This empty lot faced a carneceria and.. a "tobacco and discount store. The second store was a bright green color, almost matching one of the visiting shopping carts. Maybe that is what opened my eyes to this particular subject and art form. This is a Dollar General Shopping Cart. I like how it looks near this particular tobacco and discount store. Not many people would think of it as an art form, but I saw it both as beautiful and a study in community cohesion and also perhaps a game someone who appreciates order was playing while the other neighbors saw the utilitarian nature of the enterprise. I started calling the vacant lot “The Shopping Cart Lending Library” because some days it would have more shopping carts than other days. The first day I went there I got close up to the carts, noticed the trash in them, the broken mirror on the ground one of the carts rested atop. One day I noticed all the carts were organized by color. I had a rule, in these photos I would not rearrange the carts, I would only rearrange myself as I clicked my camera to get different perspectives. I drove by the corner again today - my daughter transfered to a different school - and the lot was empty except for the expected trash. There were no shopping carts in sight. After I found the shopping cart library last Spring, I started noticing abandoned shopping carts. I started to hear their story. A rare sight: an abandoned shopping cart in the northwest. In a vacant lot, naturally and oh, so Bakersfield to be from The Tractor Supply Store. Here in Bakersfield I found them downtown and on the East side of town, perhaps because this is where I spent the most time. I also noticed they did not appear in the Northwest, which my son calls “Casper-land because it is so white!” and more uniformly affluent. I realized many people in my town didn’t know about the shopping cart lending library or its cousins, the shopping cart collections at highly frequented bus stops that neighborhoods shared as they got off and on the bus. I saw abandoned shopping carts as a sign of cooperation or a sign of apathy or perhaps a little of both. Until the night before last, I only photographed my shopping carts incognito, but when I stopped downtown Tuesday night, I couldn’t help but notice the most eccentric shopping cart yet. I was almost angry when the owner showed up, I thought the photo op was gone but it was simply too good to pass up. This is John, the Sculptor and my new friend with his work of art. He smiled wider than I could have imagined, showing his lack of teeth. I smiled back when he said, “Why thank you! I was on the news the other night, did you see it?” I explained this was the first time for me and he immediately pulled the greatest attraction – a mannequin head and a teddy bear– off the rolling sculpture and posed with it. He told me his name was John and he was quite congenial. He posed for me in several shots and laughed and we talked and I snapped a few more photos and he confessed, “I’m not even homeless! I live at the Decatur!” He showed me his room key. “That’s great – you stay there at the Decatur! It’s an ok place!” I reassured him. It is a welfare hotel but it does provide him warmth, protection and a consistent shower. He told me he took odd jobs sometimes and basically was one of the happiest people I have seen all week. I suppose artists usually are the most happy and sometimes the most miserable people I encounter. I had no money to pay John for the photo, but I forgot about it as we both just lived the moment fully. I have thought of taking photos of people with their shopping carts, but I wanted to bring along payment in food and small bills. John and my friend, Kimberly taught me there are many kinds of currency. A conversation and a smiling face is one kind of currency that is never emptied from my pockets. Like the shopping carts scattered around less affluent neighborhoods which I have taken to documenting, people like John are usually the ones people ignore or turn their heads when they are seen walking down the street. I have committed to not ignoring the shopping carts or the people who use shopping carts as a different form of recreational vehicle. When we choose to see beauty, these metal contraptions become beautiful and the people who use them for shelter and as a larger and more grounded back pack may even become our friends. This is one of the shots I took this morning. See the laundry, hanging on the fence in the background? The white house has a very neatly kept yard. We can not make generalizations. Just because someone hangs laundry to dry on a fence doesn't mean anything except for what we make it mean. I certainly didn’t expect to meet John-the-Sculptor with a great personality. I expected an angry perhaps drunk man who wouldn’t let me take a photo without giving him money. I was surprised and I would bet John would be surprised, too. What public art have you seen or appreciated lately? Perhaps it is time to look again and see beauty where perhaps you used to see shame or humiliation. Remember John and his sculpture, unique and profoundly perfect, instead. Repurposing, Upcycling & Finding Ways to Work with What Some People Call Leftovers! What is it that brings you to life, stirs your passion into action? What were some moments of recent satisfaction (hopefully deep satisfaction)? In what ways do you bring your passion to your life work? What action steps are you willing to take to create a life of increased satisfaction? A call to transparency: On a scale of 1 - 10, how satisfied are you? Now, what are you willing to do to increase it to one higher number on the scale. Welcome to my twenty seventh post (of 31!) for the October Ultimate Blog Challenge. 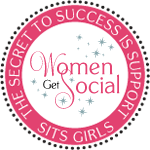 Watch here for Your Writing & Creative Inspiration! Word-Love to YOU! This is me, three days after melanoma surgery last September. My tactic in 2012, after my melanoma surgery, was to shut off yearning. I read the prompt from Meredith today for AugustMoon13 – all about yearnings: what did I yearn for last January, what do I yearn for now, what has changed? Or something sort of like that. I actually read it and closed it, read it and closed it, read it and closed it, which started my repetitive phrasing here and the search for quotes from women writers I respect. Have you developed new yearnings so far this year? Let go of old ones? Yearning is one of those words that is so deep – it is one of those words that makes a slow, careful incision in my chest, intentionally scoops out my innards and then leaves me hollow inside but all stitched up, almost like new again. I found a quote from a writer who is not a woman and it was as if a hole was punched into that hollow shell. Maybe this is why I have pushed my yearnings away or haven’t chosen to recognize them as such. If I open the gifts of my yearning, the hope, my warped belief taunts, will vaporize. It is so interesting that AugustMoon13 arrives right on the year anniversary of my melanoma and very close to the two year anniversary of the darkest day of my life, September 30, 2011. On that same day, a giant sequoia fell along the trail of 100 Giants at the Sequoia National Monument. My hypothesis is my heart was squeezed flat by my circumstance at that same moment that giant tree fell. Because of my melanoma, I stepped aside from a lot of my usual activities and cocooned with myself and my children. I stopped my involvement in theater, I stopped working with coaching clients, I stopped teaching almost all of my classes. Here I am, writing at Workhouse Arts Center. This was once a notorious prison where suffragists were force fed and held illegally. Now, it is a space for artists to thrive. This choice allowed me the space to if not examine my choices with a searchlight and a magnifying glass, it did allow me to gently watch the unopened boxes accumulate. That’s where I am now. Sitting here, surrounded by unopened gifts of hope which I now know will not vaporize, just like hope will not vaporize for you, either. The quotes from all these glorious women writers appear to be written with the yearnings aimed at another human being to complete her in some way. My yearnings are not for another, my yearnings are for me to come even more deeply into myself and to continue to examine, gently, what I offer the world in me simply being me using the gifts of my unique circumstances and my one-of-a-kind way of looking at the world. I look at the last quarter of 2013 with a completely different perspective I looked at the last quarter of 2012. In 2012 I yearned to surrender and retreat, to not be compelled to be responsible to anyone or anything beyond myself and my children. I am facing at least one more surgery. I don’t want to retreat this time nor do I want to surrender nor do I want to fight. I want to stand, strong, with gifts opened and unopened, knowing each gift of yearning offers me and my world more light and love and hope and authenticity than I can put into words right now. Writing Prompt: Resolution or Evidence: Which Do You Appreciate More? I have a love for storytelling and performance, both. I love film and theater, I love going to galleries, I love talking about all of these topics and how they intermingle. I thought to a time when I was teaching Sunday School and a very brave creator of children’s curriculum chose not to tie up the video for the lesson with a big red bow. Some of the children spoke dissatisfaction with that choice. They want and expect the resolution. They want to know the “what happened” perhaps so they know how to move forward in their own lives. Last Fall I told a story that put me in a very vulnerable position. I had never told this particular story of my life and I was so afraid to tell it. I felt as if I was opening my gut and allowing all that bloody, stinky mess fall out onto the stage floor. I didn’t end my story with a big, red bow, I ended my story with a question. “Was that what I think it might be?” was the basic gist of the final line I spoke. Artists may leave breadcrumbs along the path, but they won’t open the door to the cottage. You, the audience member, are charged with opening the door. Excuse me, what I meant to tell you is, you are privileged to open the door. Go ahead, open the door. What will stretch you more, resolution or evidence? Which will challenge you more, evidence or resolution? If you feel stuck, write your responses to those questions, stream of consciousness style. Then tuck those two questions in the back of your mind, go about your business, and tomorrow morning write your responses to those questions again without thinking or judging or even thinking. Let your pencil (pen, fingers on the keyboard) lead you. This is my twenty-eighth post (of 31!) 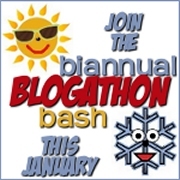 for the January Ultimate Blog Challenge. Watch here for challenge posts which will include Writing Prompts, Writing Tips and General Life Tips and Essays. It is so interesting to see the directions my art is turning as I am settling into November and Art Every Day month. Today’s piece is a part of a series I am birthing called “Fragments” – I am taking a large painting I did about two years ago, doing some retexturing, and slicing it into pieces to either collage or hang as is, separate from the rest. If you look here, you see fragments, you see half asked and half answered questions. I also see a bit of rain and the sky and perhaps sunset in the desert. I see tears, I see straight and curvy lines. I didn’t want to cut apart my painting at first, but again the intuitive nudge (or should I say tackle) made me do it. My plan is to hang these separately and together, to offer them to people separately and together, and trust the message will be heard no matter where these pieces land. This first fragment is tempera on paper mounted on masonite and covered with a light glaze. Keep watching here for more developments…. I am still working on a piece I started three days ago, too – my house has lots of art-in-process everywhere… thank goodness for a patient family! What has been tickling your creative fancy? It started with a strange tickle that lived in the back of my throat and slowly crawled toward my belly. It happened last Sunday when I had the not-so-sudden realization I miss the stage. I miss performance. I miss creating collaborative performance art. This time, though, there is nothing I can do about it except wait. I am on the Disabled List: the DL. No theater for me until my scar turns into at least slightly more easily masked by make-up. Now, before you “Pshaw” my thoughts – as I know some of you will – recognize I am respecting the audiences first and foremost. After all, I am the audience member who hears two people telling wildly divergent stories both using the same metaphor within thirty minutes and it gets under my nostrils in the most annoyingly itchy way. I don’t want audience members to be distracted by the “is that meant to be there?” or “does she have a smudge on her face?” or “did she have some sort of facial surgery she doesn’t want us to see?” to distract from the storytelling. My job now is to wait and to do the best I can to enjoy the waiting. I have actually committed to do some storytelling soon although I don’t know the exact date. This is a step in the right direction: low key commitment, not much time investment, and even though I have written some intense pieces in preparation, I know I can pull it off. I know I can pull it off well. It is like I have told actors and directors before: because I never know when my last time on stage will be, my intention is always to do the best I am able to do each time I am out there and revel in the experience, no matter what it brings. It is up to me to be sure I make that the exact place I want to be. For right now. This is my eleventh post (of 31!) 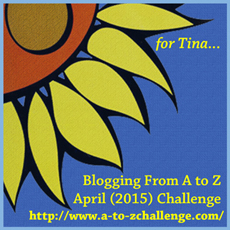 for the October Ultimate Blog Challenge. Watch here for challenge posts which will include Writing Prompts, Writing Tips and General Life Tips and Essays.